Do you have God's Holy Spirit? Are you a Spirit-begotten child of the living God — a true Christian? This concluding study in our three-part series on the Holy Spirit will show you where to find the answers to these crucial questions, in your own Bible. But first, let's review a few facts we learned in the last two studies. This foundational knowledge is vital to understanding. The Holy Spirit is the power, mind and life of God, not a third person in the Godhead. God is not a limited "trinity," as much of professing Christianity incorrectly believes. God is a Family. And God is in the process of expanding His universe-ruling Family. Jesus Christ is the firstborn Son of that divine Family, and true Christians are heirs to inherit sonship with Christ in God's Family — to receive eternal life, power and glory, when born of God's Spirit into the Kingdom or Family of God. But before a Christian can be born of God, he must first be begotten by the Spirit of God so he can grow spiritually, developing the righteous character of God. This process of spiritual growth and development is possible only through the Holy Spirit, which imparts the power to fulfill the righteousness of God. Let's understand a little more about this spiritual growth process and learn how we can know without any doubt whether or not we have God's Holy Spirit. 1. According to the Bible, who must all Spirit-begotten Christians strive to emulate? Ephesians 4:15, I John 2:6, I Peter 2:21. What is the end result of this spiritual growth process? Galatians 4:19, Ephesians 4:13. 2. Does Christ "live" in Spirit-begotten Christians to help them grow spiritually? Colossians 1:27-29, Galatians 2:20, Hebrews 13:20-21. Exactly how does Christ dwell in them? Philippians 1:19, 2:5, Romans 8:8-10. If we have the mind of Christ — if Jesus Christ is in us by means of His Spirit — we have the power to grow spiritually as we allow His Spirit to lead us along the path of righteousness (Romans 8:14). Through God's Spirit, we have the ability to obey God and thereby grow in the holy and righteous character of God. We actually come to think and act the way God does. Notice again how Paul explained this when he addressed Spirit-begotten Christians in the Church of God at Rome: "But you are not in the flesh but in the Spirit, if indeed the Spirit of God dwells in you [that is, the Holy Spirit from God the Father, which transmits God's own attributes and characteristics]." But notice what Paul added: "Now if anyone does not have the Spirit of Christ, he is not His" (Romans 8:9). A person who does not have God's Holy Spirit does not belong to Christ — he is not a true Christian! Paul was talking about the Holy Spirit from God the Father — the seed or germ of spiritual life that begets us spiritually as the very children of God Himself — the Spirit sent to us from Jesus Christ so we can overcome and grow spiritually and have God's own character developed in us. Since the presence of God's Spirit in one's mind, or the lack thereof, is the sole factor that determines whether or not a person is really a Christian, it is important to understand how one can know if he has the Holy Spirit. 3. Did Jesus Christ clearly indicate that a person is known by his "fruits," or works? Matthew 7:20. How did He describe Himself, His Father and true Christians? John 15:1-8. How much fruit does God expect Christians to bear? Verses 5, 8. This is the reason God calls Christ's disciples — to bear much fruit. Jesus was not talking about a momentary emotional thrill or experience that proves you are one of His. That is not true conversion at all. Once begotten by the Holy Spirit from the Father, you must continually be led by the Holy Spirit and bear spiritual fruit throughout your Christian life. But what spiritual fruit, or results, does the mind of Christ through God's Spirit produce in one who is striving to do the will of God? 4. In Galatians 5:22-23, the apostle Paul outlined the fruit or results the Holy Spirit produces in a Christian. What is the first fruit Paul lists? Verse 22. Also notice Romans 5:5. Is love the basic characteristic of God's nature? I John 4:16. Is it the greatest attribute God transmits to us by the Holy Spirit? I Corinthians 13:13 . Be sure to read all of I Corinthians 13 to learn more about this all-important characteristic of God's nature. The Holy Spirit imparts the traits of God's character to true Christians. And the first and most important fruit of God's Spirit is love. It is not a form of human love, but the divine love that comes directly from God. The Greek word translated "love" in Galatians 5:22 is agape. It means devotedness or kindly concern — an intense desire to serve God and man. 5. Is this the same love that will enable us to fulfill — to obey — God's law? Romans 13:8, 10. Did Paul clearly indicate which law he was referring to? Verse 9. Humans have had many conflicting ideas about how God's love should be expressed in a Christian's life. But God makes it very clear that His love is expressed by obedience to the Ten Commandments. Obedience to the first four commandments expresses love toward God, and obedience to the last six commandments expresses love toward fellowman (see Matthew 22:37-40). The apostle John plainly stated how God's love is to be expressed and then defines it: "By this we know that we love the children of God, when we love God and keep His commandments. For this is the love of God, that we keep His commandments" (I John 5:2-3). 6. Can one who refuses to obey God's commandments possess the Holy Spirit and its all important fruit of love? Acts 5:32. When you receive the Holy Spirit, the love of God is the first and most important fruit that will begin to show. The other fruits of the Spirit mentioned by Paul in Galatians 5:22-23 amplify this basic characteristic of God's nature — the divine love given to those whom God begets by His Holy Spirit. 7. Is faith another vital fruit of the Spirit of God? Galatians 5:22. Is it possible to please God without real faith? Hebrews 11:6. Must obedience to God accompany one's faith in order to make it alive and acceptable to God? Romans 3:31, James 2:14-26. 8. Is the faith all Christians must possess, and which comes as a gift from God (Ephesians 2:8) through the Holy Spirit, in reality the faith of Jesus Christ? Revelation 14:12. In Revelation 14:12 is a description of the true Church of God. Those in God's Church have the faith of Jesus. It is not just their faith in Him, but His faith placed in them and acting in them! That faith — the very faith of Jesus Christ — enables them to live God's way of life — conduct themselves as God conducts Himself. If we were able, of ourselves, to supply the faith to obey God, our obedience would be self-righteousness, which to God is but "filthy rags" (Isaiah 64:6). Our righteousness must be through the faith of Christ. Yes, Christ's faith, not our own! 9. When one receives the Holy Spirit, will these fruits suddenly appear overnight — almost all at once? II Peter 3:18 . Fruit does not appear overnight on a tree. It takes time, water, the nutrients in the soil and sunlight to grow. Likewise, it takes time to grow spiritually and manifest the fruits of the Spirit once a person has received the Holy Spirit. After studying the above verses in the Bible, can you say that you are a Spirit-begotten child of God — a true Christian? Is the Holy Spirit at work in your life, producing its fruit? Do you have the love and faith of God motivating you to live by every word of God? If not, then review the last five ministudies that have appeared in The Good News, beginning with the January, 1985, study, to see exactly what you need to do to receive God's Holy Spirit. You should also feel free to read our free booklet Just What Do You Mean Conversion? and our free reprints "Just What Is the Holy Spirit?" (Good News July 1964) and "How You Can Be Imbued With the Power of God." 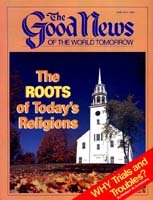 (Plain Truth April 1979) They explain much more about God's law, repentance, the Holy Spirit and other facets of the Christian life.